President of Feng Chia University, Taiwan (FCU) and his delegation paid a visit to Chung-Ang University (CAU) on March 15 (Fri) to discuss signing of a dual degree program agreement, further student exchange and joint research between the two universities as well as the future of higher education. 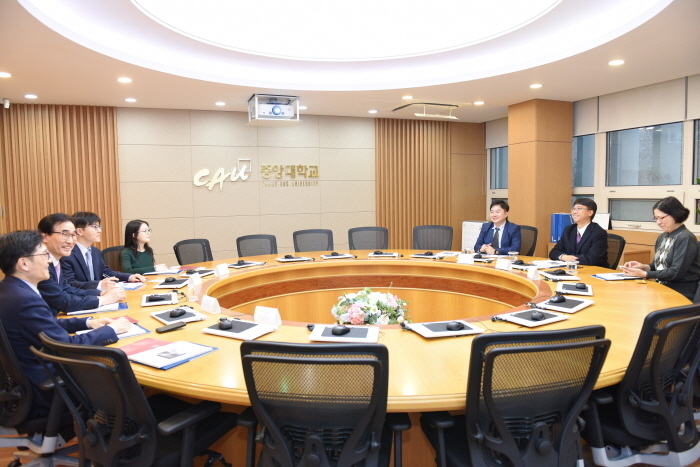 CAU President Kim Chang-soo and Vice President for International Affairs Hong Jun-hyun attended a meeting joined by FCU President Lee Bing-Jean, Dean of International Affairs Lai Wen-Hsiang and Office of International Affairs Secretary Amanda Chen. Established in 1961, Feng Chia University is located in Taichung City in central Taiwan. In recognition of its academic excellence in Business and Engineering, the university was accredited by the Institute for Ethics and Emerging Technologies (IEET) and Association to Advance Collegiate Schools of Business (AACSB). The university has been actively engaging in full-time student exchange annually and running short term programs since the signing of a student exchange agreement with CAU in 2006. Signing of an agreement on creating a dual degree program between CAU and FCU’s Bachelor’s Program of International Business Administration (BIBA) is under discussion and CAU has examined the possibility of signing a dual degree program agreement with FCU’s Master’s Program of International Business Administration (IMBA). All courses of FCU’s BIBA and IMBA programs are offered fully in English. Once the two universities sign a dual degree agreement for Bachelor’s and Master’s degree programs, student participants can earn two Bachelor’s and two Master’s degrees of both universities in 6 years. Feng Chia University has signed a student exchange agreement with about 300 higher education institutions worldwide. In particular, it is implementing its dual degree agreement with Purdue University, the US and San Jose State University, Australia. The meeting was followed by a campus tour where the delegation had an opportunity to look around CAU’s advanced facilities including the Teaching & Learning Center Studio, Creative Complex and Da Vinci Classroom in the Centennial Hall (Bldg. 310).